(Crouesty, France)- Over the past weekend, the YC du Crouesty Arzon hosted the J/80 Duo Crouesty Regatta using new racing format- doublehanded racing of J/80s. This was done because of the “European Vacation” problem; traditionally, it is always difficult to gather crews at the end of August, hence the idea of testing a new racing format. And, it was also an opportunity to show the versatility of the J/80 as the “Swiss Army knife” of sailing- the ability to sail it for a variety of purposes, such as leisure, sailing school, match race, fleet race, and now as a doublehander. The battle is on still to determine the final spots in the top five for the J/80 Coupe de France since there are two large regattas left on the calendar- The Atlantique Telegramme in Lorient from September 21st to 23rd and the final event will be the French J/80 Nationals in Pornic from November 1st to 4th. 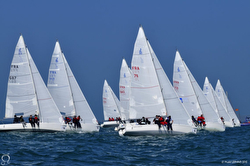 For more French J/80 class sailing information Add to Flipboard Magazine.